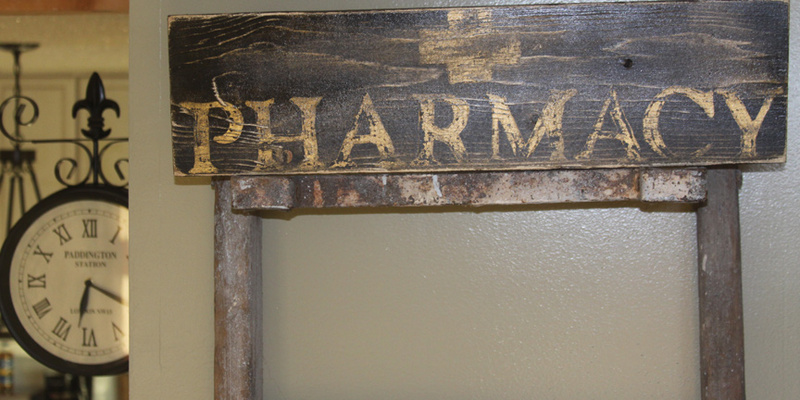 A scrap piece of wood and a couple colors of paint turn into a charming vintage looking pharmacy sign in just a few short steps. This totally unique sign is the perfect touch for any type of decor. My dear friend had just moved back from college, bought a new house, and was taking on a job as the newest pharmacist in our small town. I wanted to give her a gift that would celebrate her new home and her new career. This vintage looking Pharmacy sign as is what I came up with. The first thing to do is find yourself a scrap piece of wood. 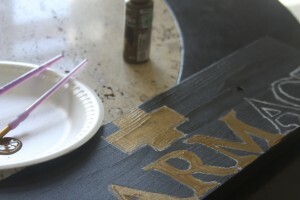 Using your sponge brush (or whatever you have) paint a layer of the bronze paint onto the board. After this layer of paint is dry, spray a nice layer of black spray paint over the top. Make sure to cover all the edges of the wood. Measure it’s length and width, and print out a template in a size that will fit your board. Find a font that you love and print it out (I used all capital letters for this sign). 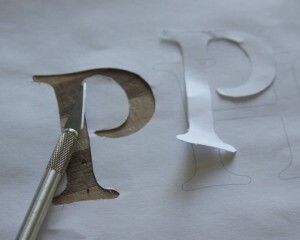 After it is printed, cut out your letters using and exact o knife and a cutting board. 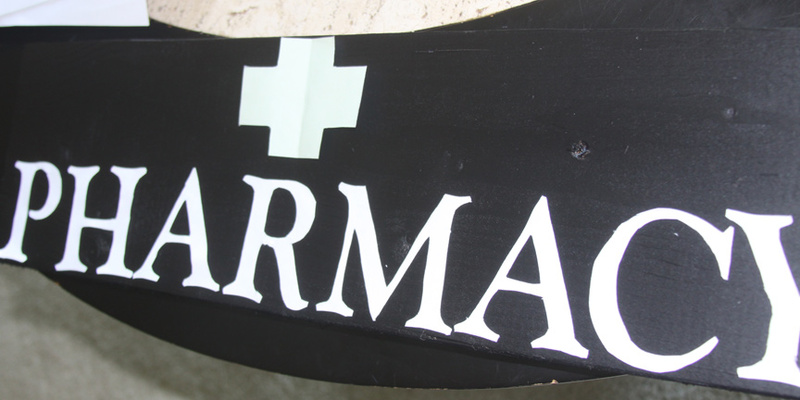 Place your cutout letters and medical cross where you want them to be on your sign. 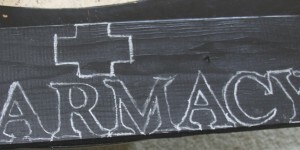 Trace around your letters using chalk (because your wood is now black). Because you are going to be distressing the sign you don’t have to be too exact. I like the character of signs that are not perfect. They look authentic and old-school! I like that. Once you have your cross and your letters drawn out take a small paint brush and paint them in using your bronze acrylic paint. 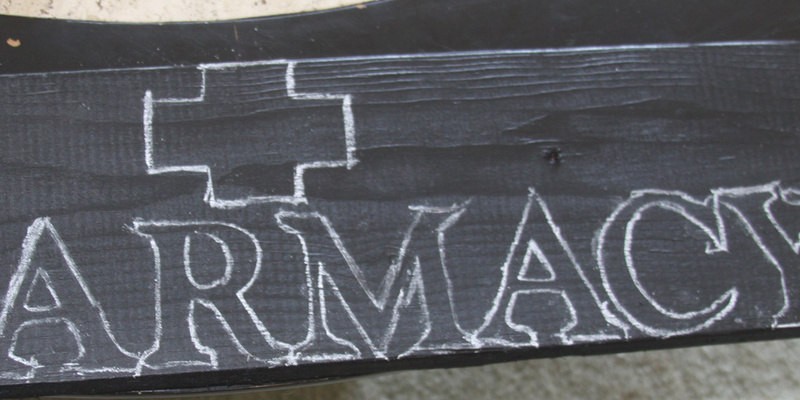 Let this dry completely and then you can rub off the chalk outline. Now you are ready to distress your sign. Because the paint is acrylic you need to sand carefully and slowly so that you don’t sand off all your hard work! I like to distress the edges a lot. I go around each corner of the sign and sand until it looks just right. For the front I do the same – just take it slow and sand until I have the look that I want. When you are happy with your distressing wipe clear of dust (or use a tack cloth) and you are almost done. Add a layer of indoor/outdoor lacquer to add a little shine and protective coating, and presto. 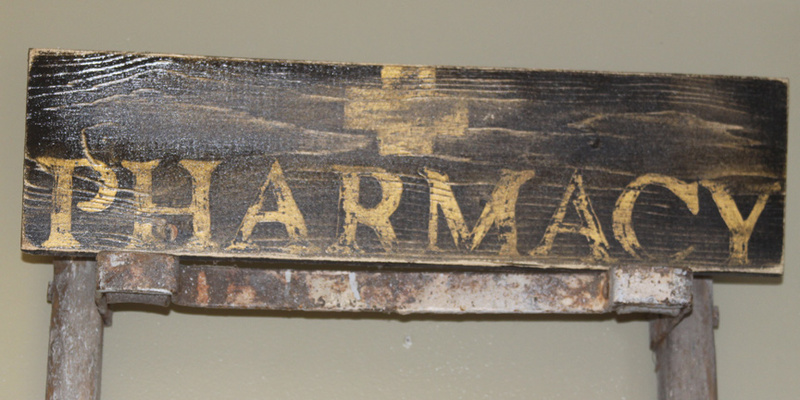 A brand new “old” sign with all the old world charm! I love it – of course! I’m so happy to have one of your beautiful, thoughtful creations in our home. Michele – I am very honored – Thank you so much for thinking of A Spotted Pony! I will be sure to head over to your blog 🙂 Thank You!